The Hyundai Velsoter is a game-changer when it comes to value for money in the small hatchback segment. Hyundai makes no effort to hide the fact that, when designing the Veloster, they looked to another company&apos;s product for inspiration. The car they looked to was the old Honda CRX, the same car which Honda claims has been reborn in spirit with the new CR-Z. Hyundai has certainly gotten at least some of the elements of the CRX down. Weight, which is one of the most important things for those chasing the legacy of the CRX, is one of things which have been done right. 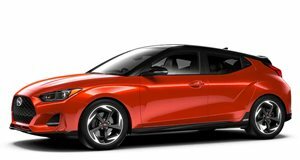 At 2,584 pounds, the Veloster is around 400 pounds lighter than its nearest Japanese competition, the Scion tC. The Veloster is also noticeably cheaper than the tC, but there is a downside to this, it also has noticeably less power. The 138hp produced by the 1.6-liter engine is in the same neighborhood as what the CRX put out, but cars have gotten heavier since then, and 138hp is a dangerously low number for something which is trying so hard to look sporty. 2013 will see the introduction of a turbo model with 208hp on tap, and this is a much more appropriate number for this car. The naturally-aspirated version will get the job if you don&apos;t intend to really flog it, but still, you want your car to go as good as it looks. And the Veloster does look good. The door arrangement is a bit odd, one door on the driver side and two on the passenger side, with a big hatch on the back. It&apos;s not unheard of for a car to offer one or two small suicide doors to help out backseat passengers, but the single rear door on the Veloster has its hinges on the front, and can open independently of the front door. Since it&apos;s only possible to look at one side of the Veloster at a time, this asymmetry isn&apos;t something that you&apos;d actually notice if you weren&apos;t looking for it. Strange though it might be, neither side looks as though it has either too many or too few doors. There is an option of either a dual-clutch automatic, programmed with fuel economy in mind, or a more entertaining three-pedal manual. The automatic makes sense for the 138hp engine, as it is predicted to be capable of 30 city/40 highway fuel economy figures, but it would be surprising if many people elected to have it bolted to the turbocharged version of the engine. Customers will also get a choice of either 17- or 18-inch wheels as well. There is also a panoramic roof, and this illustrates the most important thing about the Veloster. With an estimated MSRP of just $17,500, the Veloster is a fantastic example of what has made Hyundai into the brand it is today, their ability to give you so much for so much less money. For those buying a car in this segment, the few thousand dollars between the Veloster and the cars which it will be competing with will make a big difference, and you can expect to see quite a few of these on the streets in the near future.